Home / History / Buildings / D.H. Cowles and Co.
After the building at this location was burned in the Great Fire of 1864, the current building was erected in its place. Designed by architect Marcus F. Cummings, the building was completed later in 1864, and was constructed using Queen Anne-Italianate commercial brickwork that was inspired by Italian battlements. Since the Rockwell House Hotel, the Jerome Lapham House, and the second Glens Falls Insurance Company building have all been demolished or destroyed by fire, the D.H. Cowles and Co. Building is the only surviving Cummings-designed structure in Glens Falls. The original occupant of the building (and the man who commissioned its construction) was Daniel H. Cowles, who served as President of the Gas Co., Director of the Glens Falls Insurance Co., and Director of the Glens Falls National Bank. Cowles ran a successful dry goods retail business out of the building at 6 Warren Street. In the 1770s, the lot was home to a large, pre-Revolution era log structure, which was built by Abraham Wing, the founder of the city. This building was known as "Wing's Tavern," and operated as a store and an inn. By 1812, the tavern had become "Emmend's Hotel," and by 1816 it was "Derby's Hotel." The business changed hands a few more times before Cowles took over the site. He moved the building's structure to Sherman Avenue and built a brick building in its place to serve as his business headquarters. It is this building that burned down in 1864, and was replaced by the structure Cummings designed. D.H. Cowles and Co. was bought out in 1880 by Holman, Haviland & Co., which started a revolving door of ventures setting up shop at 6 Warren Street. Some of those include Harry Floyd Jewelry (1891); Burt & Moss Cigars (1901); Thorton, Tichor and Daily Cigars; Collins News Room; and a fruit store (1931). Today, the D.H. Cowles and Co. building is home to Barton, a family-owned company that produces high-quality garnet abrasives, in addition to other products. Fountain Square Outfitters also operates in a portion of the first floor. 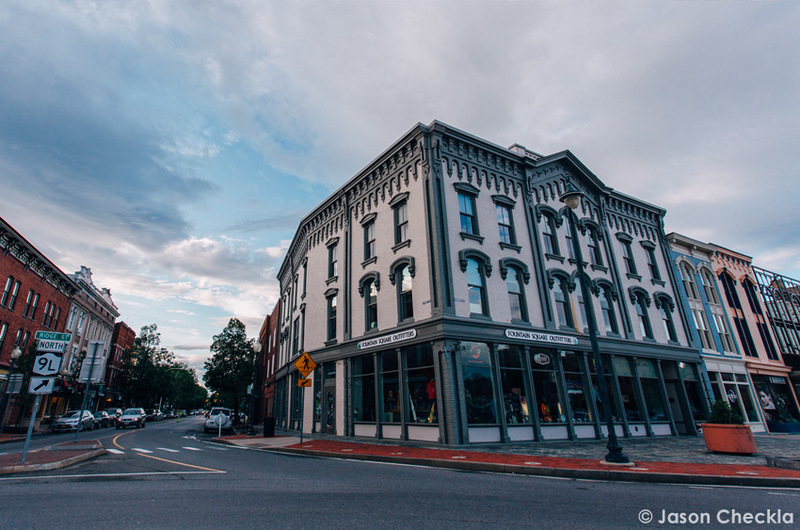 Recent restorations have helped to preserve the building's original appearance, and it remains one of the best examples of Italianate brick architecture in a commercial setting north of Albany. The D.H. Cowles and Co. building is part of the Three Squares Historic District that was added to the National Register of Historic Places in 1984.